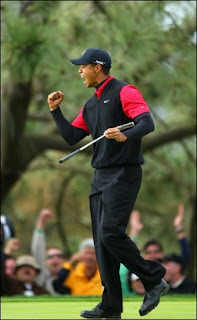 My Opinion on Sports: Tiger Set For Best Season Ever? In 2000 Tiger Woods won nine tournaments including three straight majors. Now in 2008 he appears primed to shatter that mark. Tiger’s win at Torrey Pines, in the Buick Invitational, over the weekend was the 62nd of his career which is good enough to tie him with Arnold Palmer for fourth place on the tour list. More impressive though wasn’t that he won but rather how he did it. Going into Sunday Woods had a 12 stroke lead which all but made the final day a competition for 2nd place. Going into the weekend Tiger had won three consecutive years at the Buick and by Friday there was no doubt that this would be his fourth. "My goal going into today (Sunday) was to finish second," Ryuji Imada said. "That's almost like winning the golf tournament to me." Woods has been the PGA’s best player for a while now but this past weekend he showed that he is now head and shoulders above the rest of the field and the field is recognizing it. "He's just much better," said Fred Couples, who posted his first top-10 finish since the 2006 Masters. "It's fun to see. I've been on tour for 28 years, and I've never seen this stuff." "I'd say this is the best I've seen him play," Stewark Cink said. "The last couple days, off the tee, the control he had was just really very impressive. The Tiger that we saw a year and two years ago, hitting it sort of all over the place, I think that's a thing of the past. He's got it geared down and he came out and played really well." "You'd like to think it's surprising, but it's not," Charles Howell III said. "It's Tiger." Yeah, it’s Tiger but not like we’ve seen him before. We’ve seen him dominate tournaments from start to finish and we’ve seen him dominate during stretches of the season but we have never seen him dominate the tour from start to finish. We very well could see that this year! Tiger’s streak in 2000 was monumental but 2008 looks to be historical. "I'm starting to get better," Tiger said. "I'm hitting shots that I never could hit before, even in 2000. People think, 'Yeah, you played great.' But I made everything. I'm actually hitting the ball better now than I did during that stretch."